Brighton and Hove Albion manager Chris Hughton feels his side shouldn't have allowed Derby back into the game during their FA Cup fifth round win this afternoon. The impressive Anthony Knockaert and Yves Bissouma scored as Albion took control in the first half against Championship side Derby, but the visitors improved after the break and almost grabbed a late equaliser after Ashley Cole's first goal for the club gave them a lifeline. Hughton said: "Mostly pleased. It was very nervy in the end and we made more hard work of it at the end than we needed to. "For most of the game we were very good. We could have been more clinical as we had further opportunities to increase the lead. "I'm really delighted to go through, for the team and the club and everyone in my position would want a home tie [in the quarter final]." 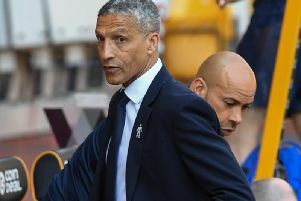 When asked if this year was the perfect opportunity for Albion to go all the way in the cup, with several of the top six top flight teams already eliminated, Hughton said: "I think so. "The cup isn't about resting players and keeping them fresh so they don't get injured. It's about managing the squad and it's a decision I have to make before each game." Hughton was also asked about the performance of Bissouma, who was instrumental throughout and it was his superb effort that hit the woodwork which gave Jurgen Locadia an easy finish for 2-0. The manager said: "He's one who is a very talented young player that is still adjusting to the game here. "He's played in the Premier League and today I thought he was very good and showed his quality. These games will all be good for him. “For a player with his talent, it is about doing it consistently week in, week out and over 90 minutes. Four players from the under 23s squad started on the bench this afternoon and Hughton felt it was a 'great experience' for them. He added: "They did what they have to do in any opportunity they can get. "Viktor [Gyokeres] has been with us for longer and trains with the first team. Leo [Ostigard] only came in the summer. We've got injuries and that gives him an opportunity to train and play with the first team. It is excellent for their experiences." Locadia went off injured late in the game and Hughton was concerned that 'it didn't look good'. "Locadia looks injured but I must admit I haven't seen him yet after the game," he said. "It looked sore. He will have a scan and we'll go from there."